“Running is fun, running is cathartic,” I sing in my head before dragging myself down for a spontaneous evening run. Admittedly, I could think of ten other things I would rather be doing at 7pm on a Monday night. The motivational force? Testing out the all-new Nike Zoom Fly Flyknit trainers. Over the recent years, Flyknits have been adapted so extensively that it’s been tough to keep a tight rein on the core essence of the shoe. While the novelty has been lost, there’s no doubt that they have solidified their presence as the running shoe that looks super fly. 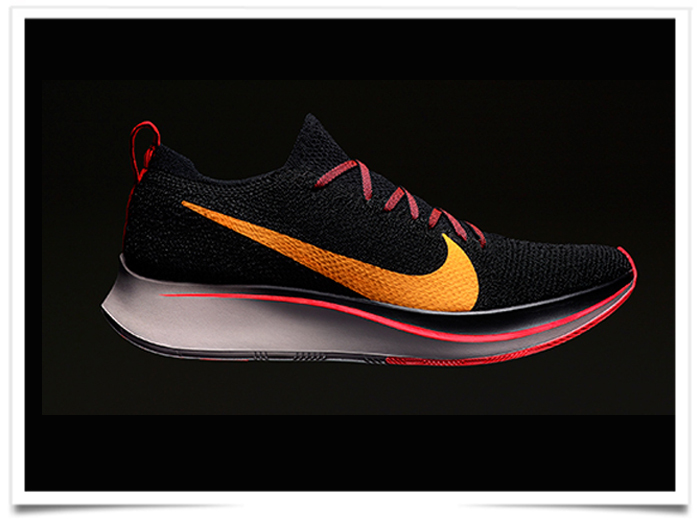 These ones I’m sporting, incorporates the plush responsive foam from the Nike React, the breathable support and structure of featherweight Flyknit, and is held by the full-length carbon-fiber plate found in the Nike Zoom Vaporfly 4%. A hybrid of all sorts. It’s lighter than most running shoes, but still heavier than the Vaporfly. What was really comforting was the fit credit due to its upper; which gently wraps around the ankle collar like how your feet feels as they slide into a pair of socks. The result is intentional it seems: as the upper fit is designed to align itself to one’s foot. My feet felt snug and well, although I can’t say the same for anyone else with a wider breadth.